Lice look like little sesame seeds, with a brownish off-white color and live around the scalp of a person. Lice eggs are oval in shape and can take on the color of the person’s hair they are living in. The parasites known as head lice can be a real pain, feeding on human blood and spending their entire lives on the human head. Yet what do these lice look like? Beyond that, how do they live and reproduce? What can be done to get rid of them? The insects colloquially referred to as head lice are scientifically known as Pediculus humanus capitis. This species only feeds on human blood, though many other species of lice infest other animals. Head lice primarily make their home on the human scalp, but they may also be found within people’s eyebrows and eyelashes. Though head lice can be irritating and painful parasites, unlike other parasites such as mosquitoes, they (thankfully) aren’t known to spread any form of disease. 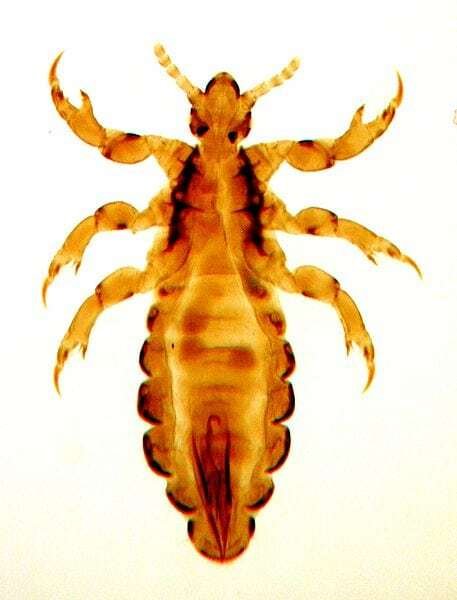 Head lice have three different phases in their life cycle: egg, nymph, and adult phase. The egg phase, sometimes called the nit phase, occurs when an adult female louse lays an egg near the base of the hair shaft, right near the scalp. The nits are attached to the hair shaft quite firmly and are thus difficult to dislodge by combing or washing one’s hair. They’re also quite small and hard to see, they are typically only about the size of a knot in a string. The nits are whitish or yellowish in appearance, and as a result, are often confused with dandruff. After about eight to nine days the nits will hatch into their next form, the nymph. The nymph phase of the louse’s life cycle refers to the time when the louse is immature, growing into an adult. It looks quite similar to an adult louse but is noticeably smaller. The nymph is already capable of feeding on blood and must do so to survive. The nymphs mature into adults after about nine to twelve days after they hatch. 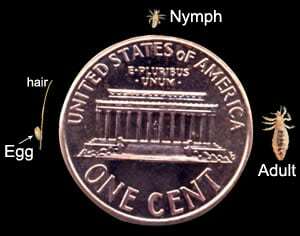 The adult louse is still very small, about one-eighth the width of a penny, or about as large as a sesame seed. The adult louse has six legs, which allow it to hook onto the hair shafts and climb them. The lifespan of the adult louse is only about one month and they must constantly feed on blood. The adult females are typically larger than the adult males, and they are capable of laying around six eggs every single day, meaning that they can multiply quite quickly. Who Is Most At Risk For Head Lice? Head lice can be found all around the world, but they are most commonly found in warm, tropical climates. Scientists divide them into different clades, and while some clades can only be found in certain regions like Nepal and West Africa, others can be found worldwide. Young children are the age group most likely to get lice, with pre-school children and elementary school children most likely to become infested with lice. Children spend more time playing in dirty areas and are frequently in close contact with one another, giving the lice more chances to spread. Lice are also more common in girls than boys because girls tend to have more hair which they can hide in. 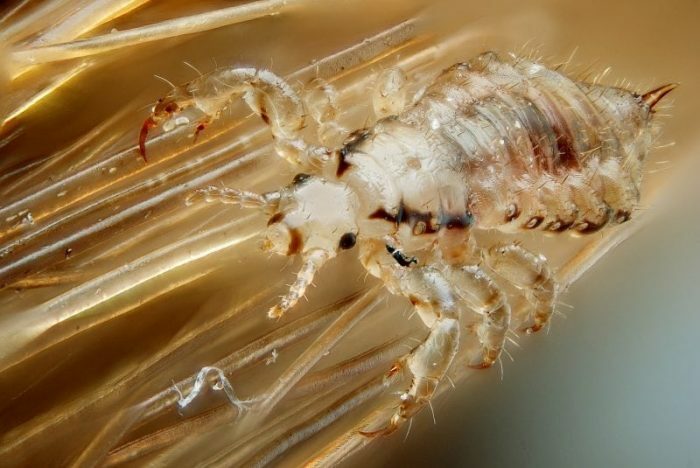 Concrete data on how many children get lice every year in the United States isn’t available though it is thought that between 6 million to 12 million infestations happen every year in children between 3 to 11 years old. African-American children are less likely to get head lice than children of other races, at least in the US, possibly because the kind of head lice found in the US has primarily evolved to grasp the hair shaft of other races. Lice are only capable of crawling around, they cannot fly and their stubby legs make them incapable of even jumping. So unlike fleas, they cannot jump from host to host. Head lice are therefore primarily spread by direct contact with a person who has the lice, or through the sharing of items that touch that person’s hair, such as combs, scarves, and hats (though this isn’t as common as direct spread). The CDC states that poor hygiene does not make one more likely to get lice. Because human head lice cannot subsist on the blood of other animals, household pets don’t play a role in the spread of lice. The typical symptoms of a lice infestation include the feeling of something moving in the hair or an occasional tickling feeling. Itching is another common symptom, as it is a manifestation of an allergic reaction caused by the bites of the lice. Multiple sores and scabs may also be found on the head, caused by the bites of the lice. It’s important to keep an eye on any sores you find as they can become infected by bacteria. Difficulty sleeping is another manifestation of the problem, as lice tend to be the most active in the dark, becoming less active when in the presence of bright light. If any of these symptoms are noticed, one should look for the presence of lice. Lice are most easily diagnosed by finding live lice or nymphs in a person’s hair on a person’s scalp. They are quite small and often blend in with the hair or scalp, so a fine tooth comb or magnifying lens might be helpful in finding the lice. If nits are found on the hair shafts, this considerably raises the chances that a person has lice, but it doesn’t provide direct confirmation. Nits which are located more than a quarter of an inch away from the base of the hair are usually already hatched or are dead. If nits are found more than a quarter inch away from the scalp, but no live lice can be detected, odds are the infestation is an old one which is no longer active and thus doesn’t require treatment. Treatment of head lice requires the use of either an over-the-counter or prescription medication. This is typically a special shampoo or similar substance one rubs into their hair, engineered to kill the lice. Along with the application of these medicines, other control methods can be used. It may be a good idea to hot wash any clothing the person wore, and to have them put on clean clothing after treatment. Vacuuming the rug and washing any bedding that the person used with hot water over 53.5°C (128.3°F) will help kill any lice that may have fallen onto clothes, carpet, or bedding. Continue to check the person’s hair and comb using a special nit removal comb every couple days for two to three weeks until all lice and nits are gone. Previous Post« Previous Measuring Ecosystem Responses To Water Availability: How Dry Is Too Dry To Hinder Evapotranspiration?